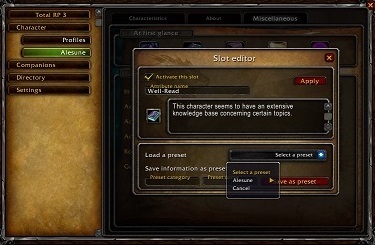 TRP3 is an addon that lets you customize your character, and in turn read about others' characters. 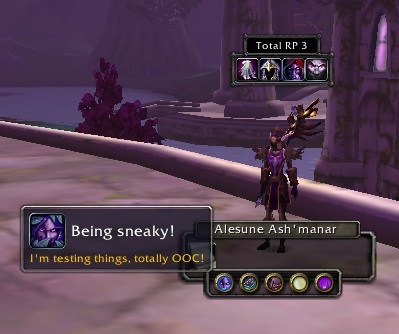 Many roleplayers use some kind of addon to be more descriptive about their toons, and some can be quite interesting to read even if you are not an RPer! TRP3 has made it to curse.com! 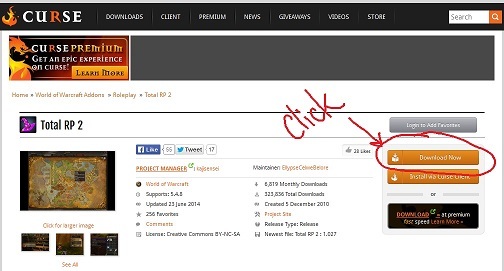 That makes it really easy to get started, simply click here to go to the curse download page. 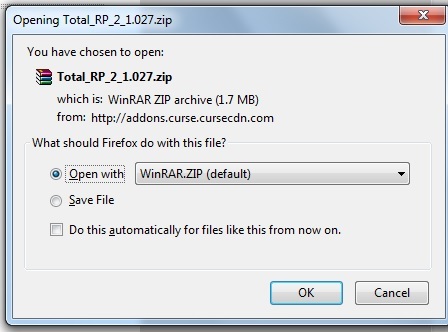 If you use curse client or already know how to download and install your addons, go ahead and skip to learning the basics of TRP3. For those who are a bit more unsure, here are the steps to download TRP3 on a PC. I have no idea how to work a Mac, so you're on your own if you play on one of those, sorry. 1. Go to curse.com and type in 'total RP3', or click the link at the top of this post. 2. Click the orange 'Download' button on the left side. You should get a popup after 5sec or so that asks if you want to open or save. Go ahead and open with WinRAR.exe. 3. WinRAR will bring up a new window. Shift+click to select all the TRP3 folders. 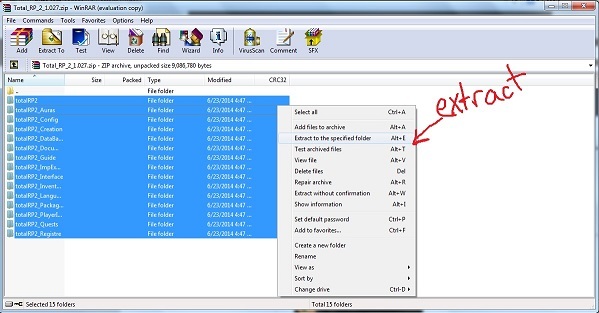 Right click when they're selected, and choose 'Extract to the specified folder'. 4. Here's where your installation might differ. My WoW folders are in my C: drive under 'Program Files (x86)'. Some are simply under 'Program Files'. You'll have to find where your WoW folder is located. 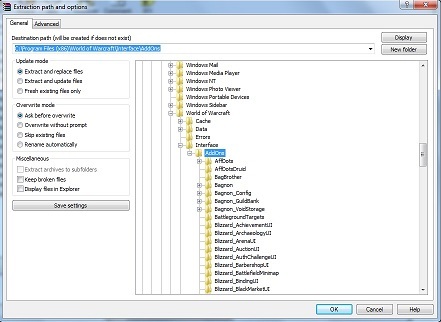 When you extract the TRP3 folders, they need to go into your World of Warcraft/Interface/Addons folder. 5. Hit OK, and the addon has been installed. 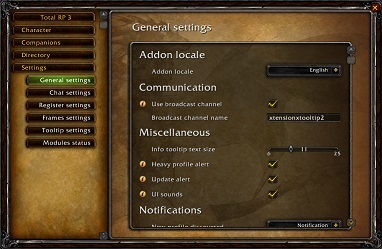 You'll have to close completely out of WoW if you have it open, so that it can restart with the addon active. Woohoo, we've sucessfully installed TRP3! Time to have some fun! Once you have TRP3 installed, you should have a bar that defaults at the top of your screen. That bar that says [Total RP3] is your "Basic Toolbar". Left-click drag to move it around your screen. The far left button is your hide/show cloak button. Click it to toggle your cloak. The second from the left is your hide/show helm button. Click it to toggle your helm. The third is your normal/away button. If you want to go "AFK/Away", LEFT-click the button (or simply /afk). To flag as "Do Not Disturb", RIGHT-click the button. The last (far right) button is your IC/OOC button. 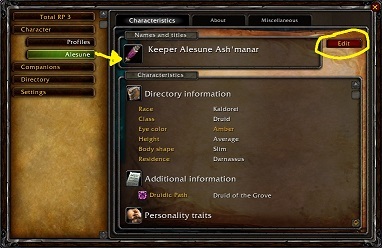 Click it to toggle between "In Character" or "Out of Character". 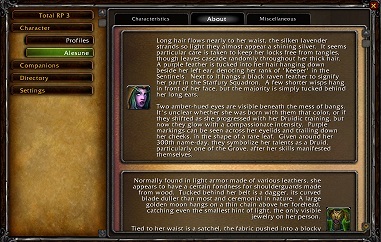 The "Scroll" icon on the far left will display the targeted character's RP Profile when clicked. The last button is the "Ignore" button. Can't stand someone? This makes it really easy to ignore someone's obnoxious trolling. Feel like you've mastered the Basic Toolbar and Character Bars? Let's move on to customizing your profile! To open the main TRP3 window, LEFT-click on the minimap icon, or hit the scroll icon when you have someone targeted. On the left side we have different tabs. These tabs will take you to different parts of the profile, so make sure you are paying attention to which tab we are talking about! At the top of the main TRP3 tab you have your IC/OOC drop down options, as well as Experienced/Rookie/Volunteer. This simply puts an icon on your mouseover so that people can tell if you would like help, or are able to help newer RPers. At the bottom of the main screen we have the "Notifications". This will tells you when a profile was added to your directory or updated. 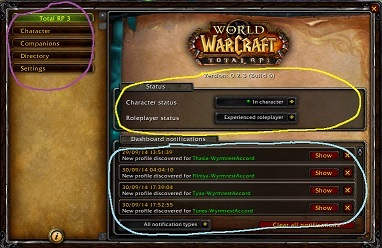 The Character Tab has two separate tabs within it: The "Profile" tab, and the "Current Character" tab. 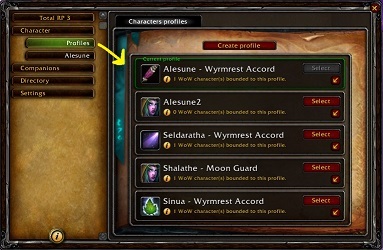 The Profile tab allows you to make/edit all the profiles for every character you have on your account. In TRP2 we were only given one profile, and had to edit it if we wanted to make a different persona for the same character. In TRP3 you can create as many profiles as you want! Simply hit the "Create Profile" button at the top of the window to create another. This makes it simple to have your REAL Character profile, and a trolltastic away profile for when you want to sit in birdform and /AFK. 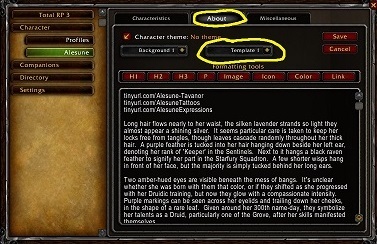 The second tab at the top of the Profile tab allows you to IMPORT profiles from TRP2. 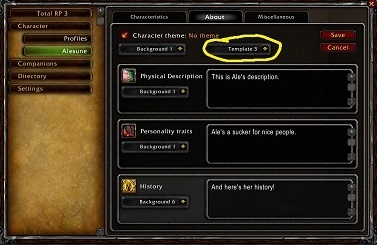 You must have both TRP2 and TRP3 installed and turned on in your addons options. Then simply hit the red 'Import All' button near the top of that window, and tada! No more need to copy-paste everything over! The second tab is the "Current Character" tab. Here is where we actually edit what other people read when they inspect your character. Near the top are three more tabs, "Characteristics", "About", and "Misc"
Editing the Characteristics allows you to change your character's name, birthplace, and all the other basic information. Scroll down and you can "Add an Additional Field", where you put the category, and then the answer. In my example I used "Druidic Calling" and specified that Alesune is a "Druid of the Grove". 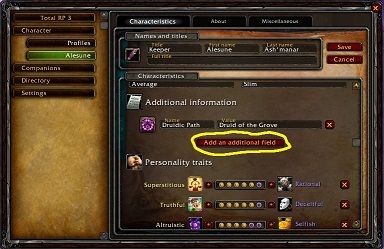 You don't have to use additional fields, but you might be able to add more detail to your character. Further down the Characteristics are the TRP3 sliders. They function slightly different than TRP2, having only 5 bars instead of 10, but mean the same thing. Add a field of your choice, and then select whether your character leans more towards one side or the other. For example, Alesune is Superstitious and believes whole-heartedly in Elune and the Ancients and will always tell the truth. Pick which sliders would say the most about your character. There is also an option to create your own sliders! The "About" tab is where you put your description and your background information. TRP3 also gives us the option to set a theme song for our characters. 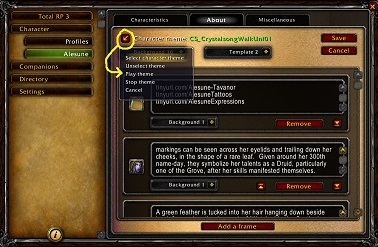 If you click on the red arrow next to 'Character Theme' with your 'About' tab in edit mode, it will open a new window. 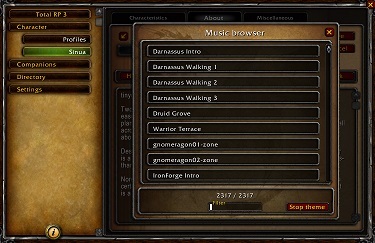 Listed are all the songs in WoW. Right click a song to preview listen to it, left click to select it. Make sure you finish saving your edited 'About' section. To add a new AaG buff, click on the icon space you'd like to put it. This will open up a new window. Fill in the information about the buff, including the name, the description, and the icon you want displayed. 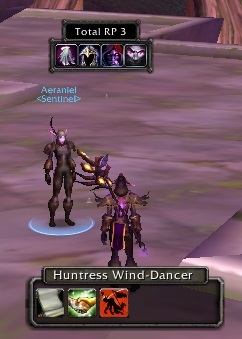 You can also save this buff in a preset, which is especially helpful if you have more than one toon you'd like the AaG buff on, such as the 'Sentinel Pride' for multiple toons in the guild. 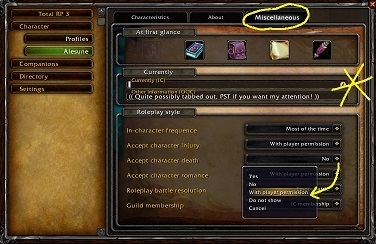 The third section gives you drop down selections for your personal RP preference. Don't want your character killed in RP? Say so! This also gives different options for character injury, if your guild is IC or OOC, how you'd like an RP battle to go (PVP, roll emote, dice rolls, etc.) and your RP habits. 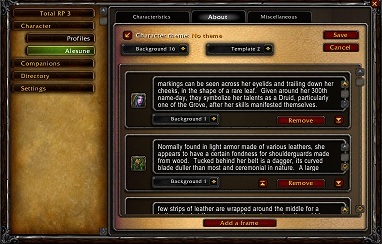 On the Companion tab you can add a pet or mount that your character is associated with. Add a companion with the button at the top, and then edit it. The edit works just like the First Template, and allows you to describe the character. You can change the name of the companion and the icon as well. The Directory tab allows you to read over anyone's profile that you have previously seen. 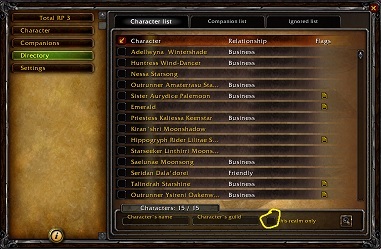 It also allows you to sort through your contacts by name or guild. The yellow icon under the 'Flags' column will tell you if you haven't read their profile. Near the bottom is a check box for 'This realm only'. 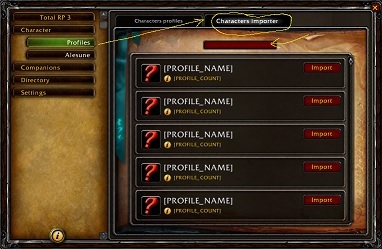 If you have a toon on a different server that picked up directory profiles, checking this will ensure you only see profiles for those on your current server. 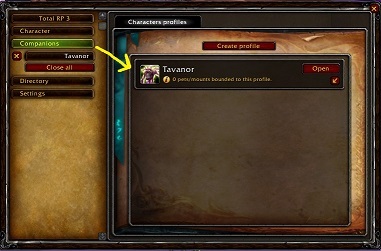 (Note: you have to have a character on a player's home server to see their profile! This means that unless you've seen them at one point on their home server, you won't see that they have an RP addon installed, which is no different from now. You'll have to visit an alt just to fill in the TRP/MRP info of those random xserver people you always see hanging out in the same spot.